The 1986 Empire production Crawlspace afforded composer Pino Donaggio the opportunity to create an exciting, tension-filled score. Donaggio opens the program with the score’s most striking composition: a haunting, elegiac Hebrew vocal, heard in “Falling From Grace With The World.” Most of Donaggio’s music in Crawlspace alternates between mounting-tension-and-suspense cues and occasional flashes of empathetic lyricism representing the relationships of the various young women living in Gunther’s apartment complex. The composer’s chaotic“Main Title” offers a sprinkling of electronics that adds additional color to the score. 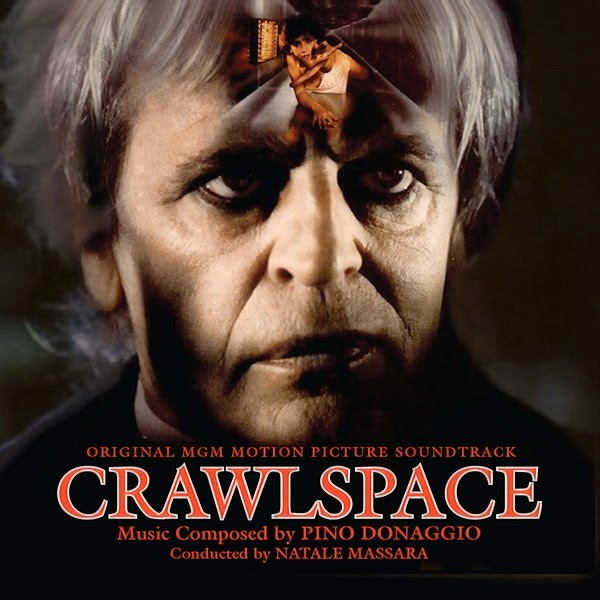 This premiere CD release of Pino Donaggio’s chilling horror score for Crawlspace was mastered from the original ¼” 15 ips two-track stereo album master prepared at KM Records and engineered by Michelle Stone for the Varèse Sarabande label in 1986. The master tape was vaulted in pristine condition. In the film, Karl Gunther (Klaus Kinski) is an apartment building landlord who peeps into the lives of his young female tenants. Crawling from vent to vent in order to observe their sexual activity, Karl isn’t just a Peeping Tom, but a serial killer—a former doctor who practiced euthanasia before moving on to other, less subtle forms of murder. Inspired by his Nazi father, Karl keeps a woman in a cage. He’s rendered her mute by cutting out her tongue, and he slays anyone who comes near his secret upstairs lair. Ultimately, his most recent renter, Lori—a Brown University graduate (Talia Balsam)—proves to be a pluckier heroine than her predecessors. Gunther’s series of brutal killings comes to an end when he gets a taste of his own medicine in the picture’s climax. Just Announced! I must point out that I saw this film on my graduation night with two beautiful friends and the first time I had worn a Hawaiian shirt... there is more to the story but that is for another time.